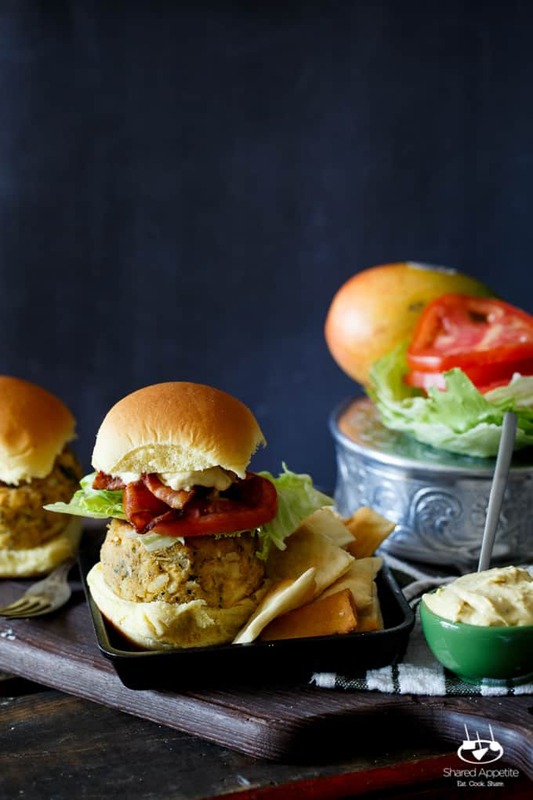 This post for Crab Cake Sandwich with Mango Bacon Aioli is sponsored by Safest Choice Eggs. As always, all opinions and recipe are my own. Thanks for supporting the brands who support Shared Appetite! Question: What should I make this week for dinner? 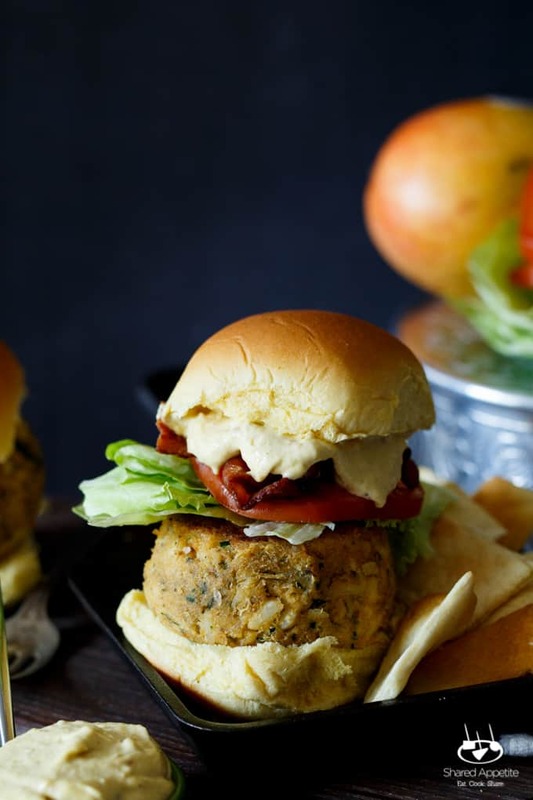 Answer: Crab Cake Sandwich with Mango Bacon Aioli! It’s the LEAST wonderful time of the year. Well, for us teachers at least. The first week of school is officially underway… and besides the whole having to put on pants thing, I also need to leave that sweet little baby girl that was just born on July 1st. Instead of getting all bummed out about having to hand her off every morning to our babysitter, I’m bringing you a recipe that reminds me of one of my favorite days I spent with Asheley and my little love bug. Two of our really great friends just had a baby as well, so we of course got together quite a bit over the summer. It felt really good to be with other first-time parents. We could share our battle wounds, after all. One night we decided to try and actually venture out into the real world, past the safe confines of our homes where our kids could feel free to cry their faces off without the fear of disrupting other people. It just got real. We ended up going to this really awesome open-air patio-esque seasonal restaurant right by the beach. Tons of fresh seafood, a vibrant atmosphere to mask the fussiness of our baby at her witching hour, and just the amazing feeling of being out of the house and interacting with other adults for a few hours. Asheley and I rarely eat seafodd. It’s just not something either of us grew up with (we come from families of picky eaters, so we blame them). But hey, when you’re at a restaurant literally a few steps off the beach… you gotta do it. Asheley ordered this really great crab cake sandwich topped with a mango bacon mayonnaise. So naturally, I had to recreate it at home. Boom. 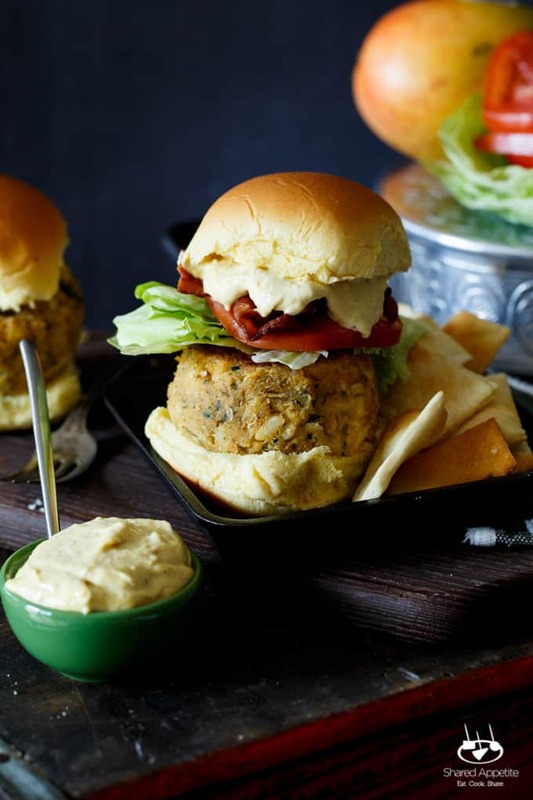 Crab Cake Sandwich with Mango Bacon Aioli. Trying to cook dinner at home is a little more tricky now that we have Olivia in the mix. There is that little itty-bitty window of time to cook and inhale our food, because of course our little girl’s fussiest time of day always has to coincide when mommy and daddy wants to eat. The struggle is real. To cut down the prep time on this dinner, I grabbed some great looking crab cakes from our seafood guy at the local market. If you have time to burn (don’t rub it in), go for making crab cakes from scratch if you are into that sorta thing. Now, this mango bacon aioli. It’s completely legit and is packed with a big, bold flavor. Before you start going on and on about all your past aioli-making fails…. try this. I’ve had my share of fails too, but this was foolproof. Ridiculously easy… and the payoff was huge. Oh… you’re worried about eating raw eggs? Me too. I’m no Rocky Balboa, so raw eggs aren’t part of my usual food intake routine. Boom. Safest Choice™ Pasteurized Eggs. Pasteurized. Goodbye salmonella, hello peace of mind. Grab The Recipe At Safest Choice™ Eggs! 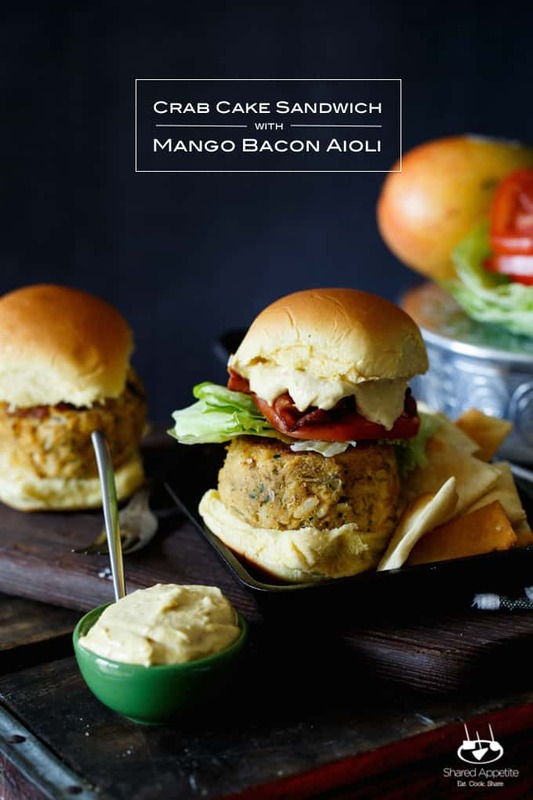 OBSESSED with the mango bacon aioli, what a fantastic concept! and I had no idea that pasteurized eggs were a thing, so great to know!